I wonder how we managed to sew sails and canvas before we discovered seamstick. Seamstick is a double-sided seaming tape with acrylic based adhesive on a mylar carrier. We prefer "Venture Tape" brand as it sticks to Sunbrella better than others. To sew an overlapped seam on Sunbrella or Weblon, apply a line of 3/4" seamstick to the salvage edge of one of the panels. Stick the second panel to the first, using the inside edge of the seamstick for an even 3/4" seam. Sew along the edge of the top panel, flip the panels over and sew on the edge of the other panel. 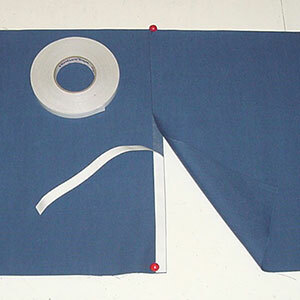 Seamstick is essential for sewing sails. For seams, apply 3/8" seamstick in the seam allowance of the lower panels and stick the next one to it. 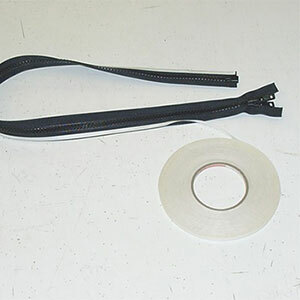 Use it to hold patches, luff tape, webbing, etc., in place for sewing. Use 1/4" seamstick to hold zippers in place while sewing. Use seamstick to stick vinyl laminate cloth to the inside of hatch covers, dodgers, etc., to reinforce for fasteners and finish the edge. When applying seamstick, be careful not to stretch in tape. This can make the fabric look puckered when the seamstick relaxes. It may help to pin the fabric out tight so this doesn't happen.